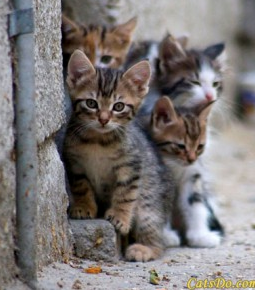 WHAT IS A FERAL CAT COLONY AND HOW CAN IT BE CONTROLLED? AND HOW CAN IT BE CONTROLLED? Feral cat colonies usually originate when lost or abandoned unaltered domestic cats congregate near a food source, such as garbage dumpsters in alleys, behind restaurants, college cafeterias and many other places. A female will find a safe, hidden place to give birth and old instincts inherited from her wild cousin, the African Wild Cat ( Felis lybica), will reappear. She will teach her offspring to be wary and mistrustful of humans. When these kittens are of age to reproduce they will teach their kittens the same. A female cat can give birth up to 3 times a year with an average of 4 kittens per litter. In the meantime, this female’s first litter will be ready to reproduce, as young as 4 months old. Within a short period of time a feral cat colony will develop. Not only do these colonies exist where dumpsters are located, they are also problems within trailer parks, apartment complexes and housing developments. Many times someone may acquire a kitten or cat and then abandon it when they move on to another residence. This is against the law in Pennsylvania. Most of these cats have not been spayed or neutered, thus reproducing and forming a “feral cat colony”. In another scenario, for one reason or another, someone may no longer want their cat so they wait until the middle of the night and drop it off at a chosen residence. Most people feel sorry for the cat and can’t watch it go hungry, so they start feeding it. If it’s an unspayed female, eventually she will bring her kittens to the food source, and a cat colony begins. 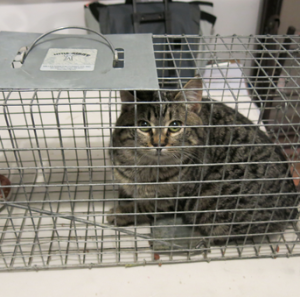 Trapping a feral can be done in a safe and humane way. When you feed an animal and allow it to stay on your property, legally you are responsible for the care of that animal. First you need to acquire a humane trap. Some SPCAs will rent them for a minimal fee or perhaps you can borrow one. Many hardware stores sell them. Newspaper should be placed on the floor of the trap. This will protect the cat’s feet from the wire flooring. It will help if you remove the cat’s food the day before you plan to trap. This way the cat will be more likely to be hungry enough to walk into the trap. Use a smelly bait: fishy canned cat food or sardines work well. Using the food, make a path from just outside the trap to the back of the trap. You can use a jar lid or simply place a small portion of food at the very back of the trap. The next step is to place a blanket or sheet over the trap covering the sides and back. Once the cat is trapped, also cover the front of the trap. This will help the cat settle down and cause less stress. Once you have trapped the cat DO NOT open the trap door for any reason. You must remember that feral cats are terrified of humans and will bite and scratch to defend themselves. Put the trapped cat in a quiet, secure and warm or cool place depending on the time of year, until it’s time to transport it to where the spay/neuter surgery will be done. It’s best to transport the cat in an enclosed vehicle and not in an open pickup, especially when picking the cat up after its surgery. The cat will need to be kept warm until it recovers from the anesthesia. The veterinarian will anesthetize the cat while in the trap. When the cat is under anesthesia the vet can safely remove the cat and performed the surgery, give inoculations and treat any unforeseen problems. The vet will “ear tip” (remove the tip of the left ear) so it will be easy to determine if the cat is spayed/neutered in the future. After everything is completed the cat is placed back in the trap for a safe return to its colony. For the cat’s safety, it should be kept in the trap until the next day. Release the cat at a familiar place so it won’t take long to feel comfortable in its surroundings. While trapping, it’s best to stay within sight of the trap, so that when the cat has been trapped you can cover the front of the trap so the cat calms down. There are those times when you may have to leave the trap uncovered. If this is the case, cover the trap entirely as quickly as possible once the cat has been caught. Never set a trap and leave it for a long period of time, or set a trap at night and leave. Raccoons, skunks and opossums are nocturnal and would be an unwelcome surprise. You don’t want to discover that black and white kitty is not a kitty at all! Feral cat colonies can easily get out of control in a short period of time. The TNR method can prevent this from happening. Altered cats are much healthier, and with the help of caring people to provide them with food and shelter and keep a watchful eye out for any possible problems, they can live contentedly for many years. Helping Hands for Animals is a not-for-profit 501(c) (3) corporation.